ean-marie Simon, Head of Atos en France; Jean-Michel Fourgous, President of the Saint-Quentin, en-Yvelines urban community; Pierre Bédier, Président of the Yvelines County Council and Véronique Coté-Millard, Mayor of Clayes-sous-Bois.18 Dec 2018 Paris - Atos, a global expert in digital transformation, together with the Yvelines departmental Council, has officially inaugurates its new energy-efficient global data centre in Les Clayes-sous-Bois, in Yvelines. This modern optimized data centre will house the most recent servers and technologies to guarantee Atos' clients - who wish to locate their data and applications on French territory and in compliance with European regulations - optimal performance, storage capacity, security, scalability and cost-efficiency. The new data centre is energy-efficient with a Power Usage Effectiveness (PUE) of 1.2, a lot less than the global industry average of 2.0 and 30% more energy-efficient than the previous data centre (1.7 PUE). This is partly due to its hyper-efficient cooling system, which minimizes water and power consumption. It is certified in accordance with the recognized ISO 14001 standard, which requires companies to implement comprehensive energy management systems to continually improve the ecobalance. The new building's infrastructure - which regulates the power, the temperature etc. - uses only 20% of the energy which is used by the servers. This next-generation data centre is another milestone in Atos' strategy to develop the historical site of Clayes-sous-Bois and the Yvelines region as a strong centre of technical expertise globally. This initiative follows on from the recent announcement of Atos' new R&D Lab, which is currently being built at Clayes-sous-Bois and due to open in 2020. 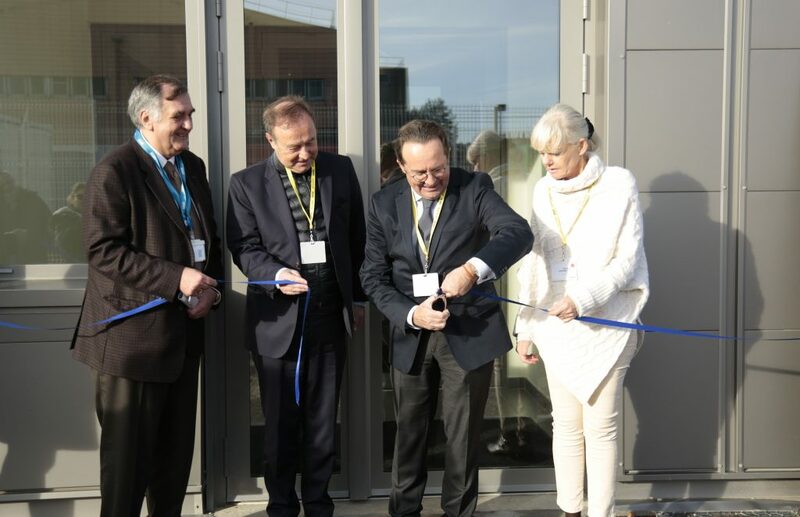 The inauguration ceremony, saw Jean-Marie Simon, General Manager of Atos in France, Pierre Bédier, President of the Yvelines departmental Council and Véronique Coté-Millard, Mayor of Clayes-sous-Bois unveil the new building to an audience of Atos employees and industry partners. "Yvelines departmental Council's mobilization and support in the development of Atos' future global innovation hub in Clayes-sous-Bois is proof of our determination to place Research & Development and digital technology at the heart of new regional challenges. This unique joint initiative with Atos and EPFIF reflects the department's ambition to develop a new approach to support companies in the Yvelines region, to assist them in their research projects and with their issues relating to land and property. Having our BullSequana supercomputer and the latest-generation Data Center in our region, show how effective this co-investment is", stated Pierre Bédier, President of the Yvelines departmental council. "In partnership with the Yvelines departmental council, I am delighted to open our new datacenter on our historic site of Clayes-sous-Bois, where the Group has been present for more than 50 years and today employs almost 1000 people. It underlines our commitment to continue to invest and develop our site and the region as a strong technical hub worldwide", stated Jean-Marie Simon, General Manager of Atos in France. "We're proud that our new next-generation datacenter here at Clayes-sous-Bois will support our clients worldwide, with the latest servers and technologies, for increased capacity, resilience and security, so that they are able to effectively deal with the challenges of today and tomorrow." The new 1300 m2data centre, which started construction in 2017, is situated on Atos' existing R&D site and is the first two in the series of eight modules planned to be built from 2017-2020. This joint initiative came into fruition from the sale of part of the land on the Atos site at Les Clayes-sous-Bois to the Yvelines departmental Council through the Établissement Public Foncier d'Île-de-France (EPFIF). Atos will be the exclusive tenant for 30 years. Atos has 93 data centres worldwide, 15 of which are in France.